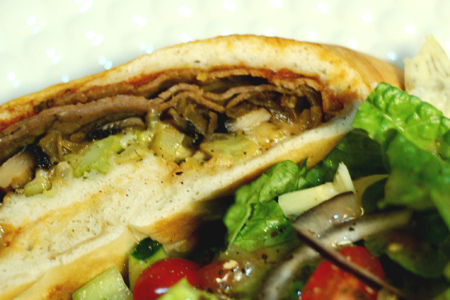 Beef, mushrooms and cheese are a great combination. 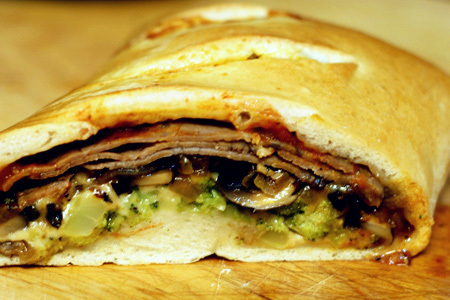 This stromboli builds on these basic flavors with sauteed portabellas, bourbon-caramelized onions, smoked black pepper white cheddar, broccoli, and a little garlic. I know that it might seem like a lot of work, but it's really not as complicated as it appears. I assure you that it's well worth the effort. 1 med Yellow onion, sliced to 1/4"
2 med Portabella mushrooms, sliced to 1/4"
Heat half of the oil in a large saute pan over medium heat. Add the onions to the pan, season with one teaspoon of salt, and cook, stirring occasionally, until the onions are soft and just caramelized. Add the bourbon and garlic to the pan, and continue cooking until all of the liquid is evaporated. Remove the onion mixture to a plate and let cool. Return the pan to the heat, add the remaining oil, let heat for about 30 seconds, and add the portabellas. Season the mushrooms with a pinch of salt and cook until they are just tender. Remove the mushrooms to a plate and let cool. Microwave the broccoli in a small bowl until it is thawed and barely hot, then set aside. Flour your rolling surface and all sides of the dough. 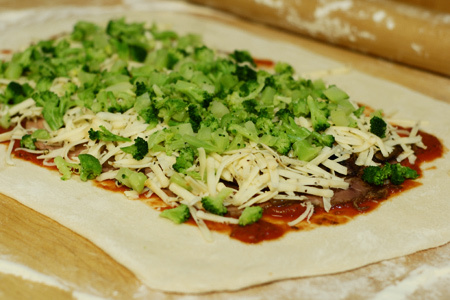 Roll the dough into a rectangle about 16 inches long, 12 inches wide and about 1/8" thick. 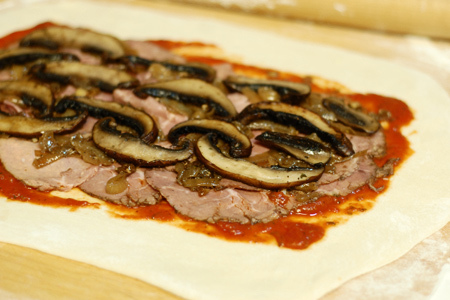 Spread the sauce evenly over the dough, leaving about a 1 1/2 inch margin around the edges. 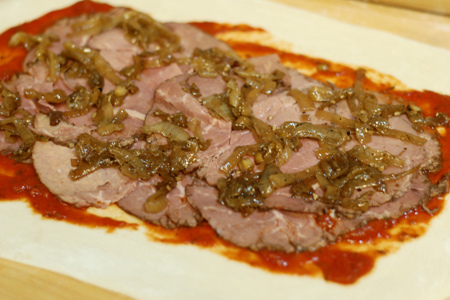 Lay the slices of beef on the sauce, overlapping as needed. Distribute the onion mixture evenly over the meat. Lay the mushroom slices evenly over the onions. Distribute the cheese and broccoli evenly over the mushrooms. 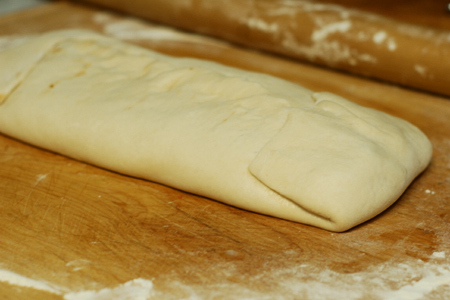 Fold one long edge of the dough over so that it covers the filling by about half. Brush the top of the folded edge completely with the egg wash. 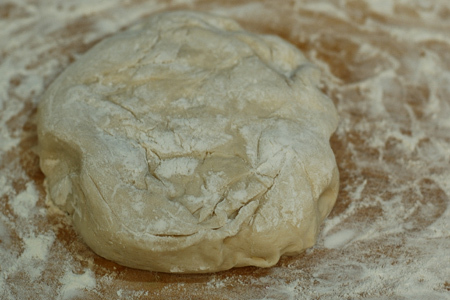 Fold the other long edge of the dough over so that it almost overlaps the first folded edge by about half. Brush the top of each short edge liberally with egg wash. Fold each short edge over to seal the ends. 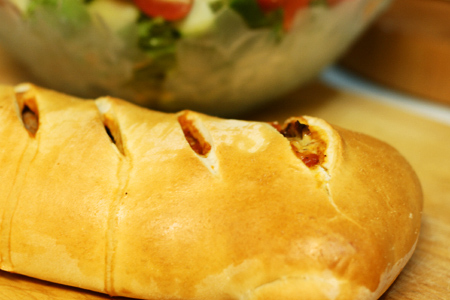 Gently move the stromboli to a sheet pan with the seam down. Cut several two-inch slashes diagonally in the top of the dough. Brush the top with the remaining egg wash.
Bake on the center rack until golden brown, about 20-30 minutes. Remove from the oven and let rest about ten minutes. Slice and serve with a nice salad.